Okay, I’m warning you, this cake is addictive! If you like banana bread, you will LOVE this. My inspiration for this cake came from Pinterest, however, I added my own little twist on it and I think it turned out great. Not only is it yummy, but it’s semi-healthy. Well, as healthy as cake can be for you, but whatever! It past the taste test with both my husband and daughter, so I’ll take that as a good sign! Oh, and it’s SUPER easy, which makes it even better! The original recipe didn’t call for walnuts or ground flax, but in an effort to make it a bit healthier, I decided to add them and was thrilled with the results. I also substituted light sour cream for regular sour cream. Luckily, I had all the ingredients on hand so that made it easy to modify. 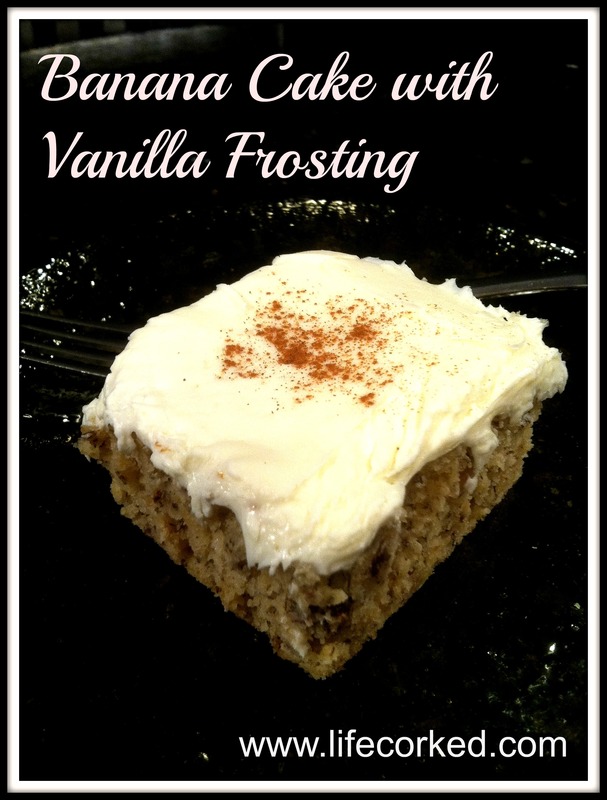 The original recipe called for homemade vanilla frosting, however, I happened to have a jar of Betty Crocker vanilla frosting on hand so I decided to use that instead. I know, store bought frosting? Gasp! Hey, I say whatever works for you, do it! To top it off, I sprinkled a dash of cinnamon on each piece of cake before I served it. It looks pretty and adds a fun flavor! Preheat oven to 350F if using glass or 375F if using a non-stick or coated pan. Cream together sugar, sour cream, egg and 2 tablespoons softened butter. Add mashed bananas and 1 teaspoon vanilla extract. Add flour, salt, baking soda and ground flax; mix well. Add walnuts; mix. Pour into greased 8×8 pan. Bake for 20-25 minutes until a toothpick inserted in the center comes out clean. Cool completely before frosting. If you’re like me you can grab that jar of frosting sitting on the shelf, or you can make an easy buttercream or cream cheese frosting. Either would be great! Yum! Would you mind if I try this and reblog it? Not at all! Let me know how it turns out! Thanks for reading! Banana anything is my favorite!! Thanks for sharing this recipe. And I happen to LOVE store bought vanilla frosting. 😉 I buy two cans when I buy store bought cake mix. LOL! Laurie, I’m glad I’m not the only one who loves store bought vanilla frosting! It’s such yummy goodness! Thanks for your comment!